We love makeup especially the liners and mascara that are water proof, smudge proof or rub proof but then, taking them off could be a task without a good makeup remover. 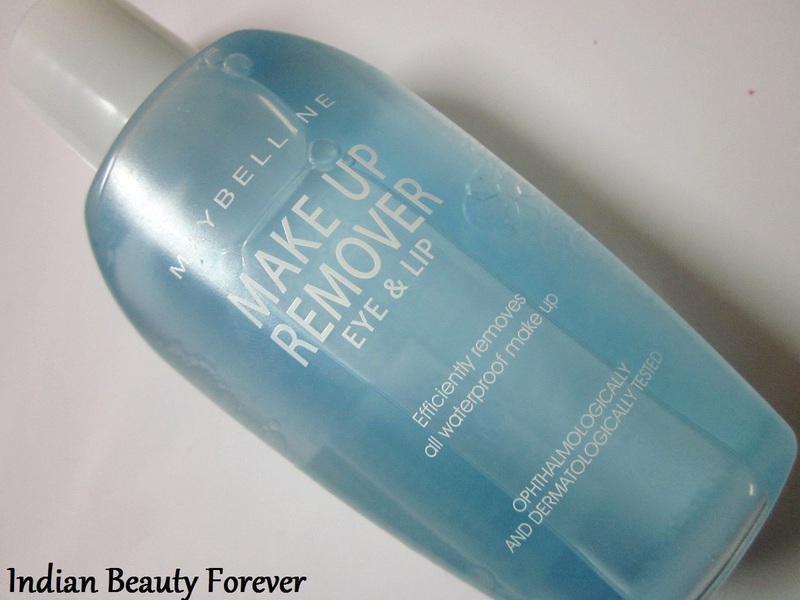 I will review Maybelline bi-phased makeup remover which is especially made for removing water proof eye and lip makeup. Keep on reading to know how it fared and its ability to remove the waterproof makeup swatches which I made for demo purpose. 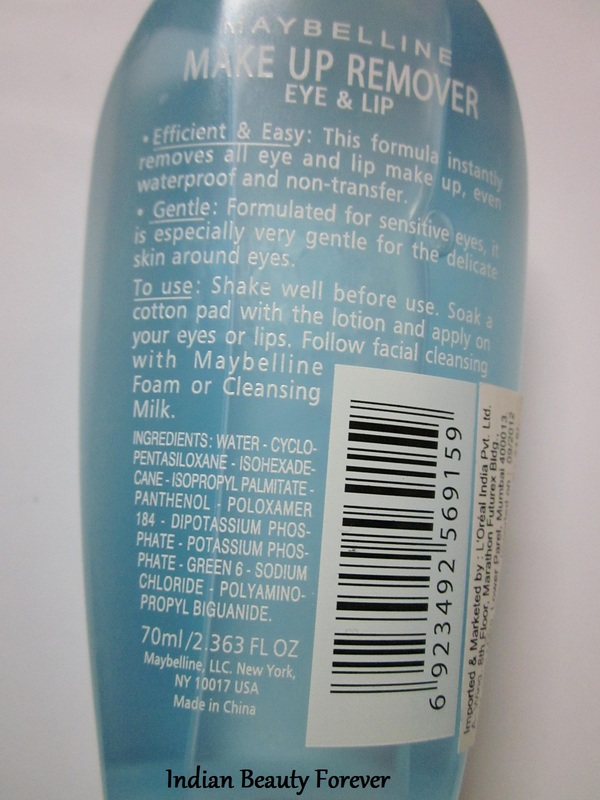 About the product: Maybelline Bi Phase makeup remover to remove lip and eye makeup. Efficient & Easy: Instantly removes all eye and lip makeup, even waterproof and non-transfer. Gentle:Maybelline makeup remover is formulated for sensitive eyes, it is especially very gentle for the delicate skin around eyes.Ophthalmological and Dermatologically tested. This moisturizing formula is tough on stubborn makeup but ultra gentle on eyes. My Experience: Earlier I had used Lakme Absolute makeup remover which had impressed me so much that now that I have finished it, I thought of repurchasing it but then, settled for this one. This Maybelline makeup remover comes in a regular plastic bottle with a cap and a stopper lid with a hole to take out the product. 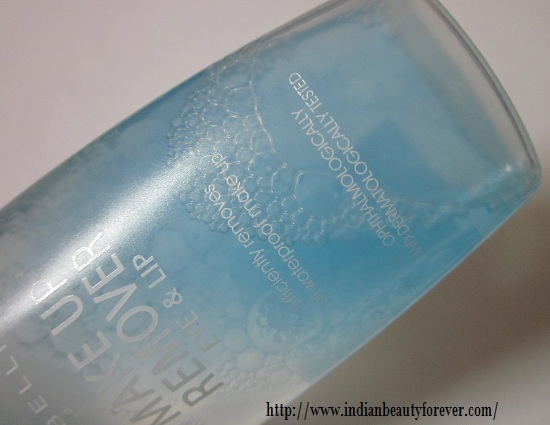 Maybelline makeup remover is a Bi phased makeup remover with a prominent oil part on the top with blue color. To use this, we have to shake it quite well and immediately take the product on a cotton pad before the two parts separates. The blue part is the oil. The oil part in this makeup remover actually works as a solvent, to dissolve the waterproof and smudge proof makeup, so that they can come off easily on the cotton pad without any tugging or pulling the delicate eyes and lip area. It is very essential to shake it well before taking it on the cotton pad! Now, below, I made a small demo to check its capability to get rid of the makeup! 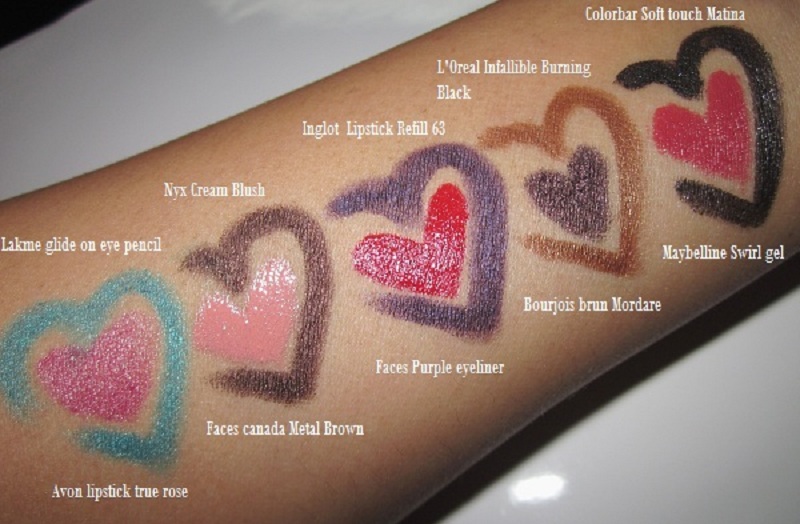 To test it, I have swatched 10 products, including lipsticks, eyeliners and eye shadows. You may see which products I have swatched on my arm and the legendary, everyone’s favorite Faces Canada eye pencils along with Maybelline swirl gel eyeliner!! After this I swiped the cotton pad once lightly and here is the result. Bourjois Brun mordare, Nyx blush, Inglot lipstick, L’Oreal Eye shadow burning black, Colorbar Matina is almost gone and faces pencils have been faded. In the second swipe everything is gone, except the areas where the cotton pad did not touch fully! due to the lighting it appears different. I took the below picture without flash! And here, there is nothing at all. It’s wonderful!! Isn’t it?? Look at the cotton pad below how it has taken everything off!! It takes off eye makeup effortlessly for which I love it a lot. After you have removed the makeup, it leaves the area moist and hydrated, I mean the eye area and delicate lip and surrounding area too. An oily film would be there but that can be easily taken off with a mild cleansers too. I have used it for considerable time and can say that it has not irritated or stung my eyes yet. It’s safe o use, I would say!! If I have to compare this Maybelline makeup remover with the Lakme absolute one then, I will say that they both did a great job but Lakme has a pump dispenser and Maybelline comes 10 ml more than Lakme absolute but without the spary pump. 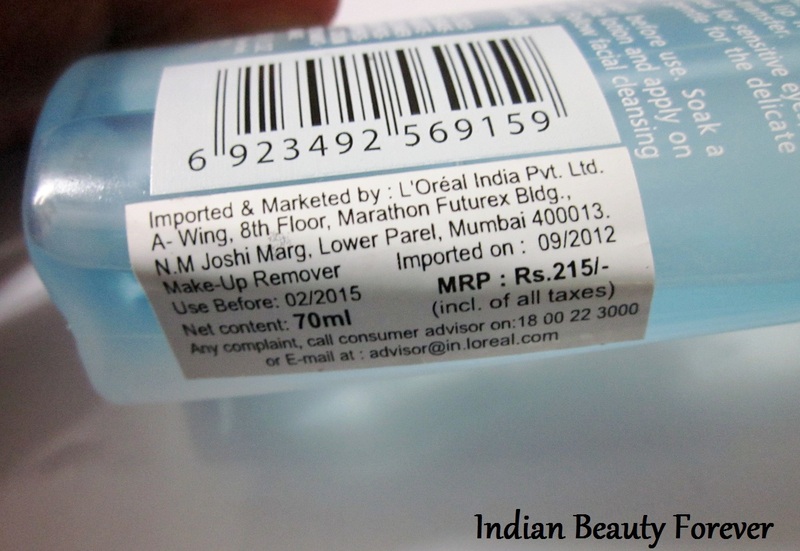 I think I will transfer the content of this Maybelline makeup remover into the empty bottle of Lakme Absolute. It is very affordable at the price and the quantity provided. Maybelline products are easily available online and offline, If you may buy it here at medplusbeauty at some discounts. Travel friendly packaging and bottle. It lacks a pump but still doesn’t make any difference, it is easy to use even without that. Takes off every kind of eye makeup easily and gently without tugging or pulling. Dissolves and disintegrates the waterproof/ smudge proof mascara or eyeliner so that it comes off very easily. Takes off all the stains left by some of the lipsticks too. It’s safe to use since I have not faced any problems yet. Once, you are done removing your makeup, it leaves the delicate eyes and lips area hydrated due to its oil part. An oily film is left, which should not be an issue as that can be easily washed off with cleansers like face wash or cleansing milk. My take: If you are looking for an eye/ lip makeup remover. do give it a try, it’s a steal at the price and removes all the traces of eye makeup effectively yet gently! Your eyes will love it as you don’t have to tug or pull to get rid of the eyeliners and waterproof mascaras. I will definitely recommend it!!. I ll give it a try when my current gets over...nice review.. Thank you Tanu. :) Its great at the price and works effectively!! You will like the Lakme absolute too Nisha, if you like this one!! Thank you Radha. :) Its great!! %th bottle.. thats good. I like it too. :) It is for sure budget friendly. I LOVE this makeup remover! But it can be quite oily.. I agree JiaWun it can be a little oil and cleansing after this is important. I am still stuck with lotion cleansers for removing the minor makeup I do, but yeah this seems like a good product to begin with ! very nice review..i will definitely get this one.. Thank you Dollie..:) It indeed has done a great job as a makeup remover!! Thank you Gagan,:) Glad u liked! I was thinking to get this makeup remover :) But I got Dove instead.. I actually don't like that oily feeling after cleaning makeup, same was with Neutrogena makeup cleaner I had before. Try it, it's very effective on waterproof eye makeup!! Try it, this is very effective and affordable!! Great review! Love the swatches. Will have to try the product. Thank you Radha. :) it works great!! Very nice review! Just loved the designs that you created..Colorful hearts. Awesome!